Here’s the Flannel Friday roundup for the week of August 10, 2012! If you’d like to learn more about Flannel Friday, please visit the Flannel Friday website. 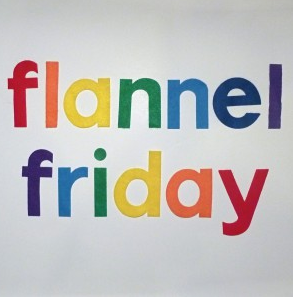 If you’d like to visually explore past Flannel Friday ideas, visit the Flannel Friday Pinterest account. And, if you’d like to see what new Flannel Friday ideas we have this week…scroll down. Anna from Future Librarian Superhero has a great idea that incorporates finger puppets, a finger puppet stage and an iPad! This one’s sure to be a crowd pleaser! Sandra at Storytime Sparks brings us an adaptable rhyme for all kinds of fruits and veggies! Great for hungry/food/harvest storytimes! Lisa from Libraryland has Halloween on her mind with this super fun storytelling prop, Halloween Hilda! The kiddos are sure to have a Happy Halloween storytime with this one! Sarah at Read Rabbit Read has some adorable penguin finger puppets with a link to the template! The rhyme that goes with the finger puppets is also very adorable! Speaking of finger puppets, Kate from Storytime Katie brings us two amazing elephant finger puppets, along with the template to make them. These finger puppets are very cute and very fun! Bridget from What is Bridget Reading brings us Blue Ted Said, a flannelboard that was inspired by Red Ted Said. Love the adaptability of this one! Linda at Notes from the Story Room shares a folktale that she adapted from 1001 Nights and a magnetic board that she made to go with it! This one’s perfect for a dreams storytime, and the children will love the twist at the end! Lucy from In the Children’s Room gives us a great flannelization of the classic Row, Row, Row Your Boat! Kids will love this one! Sharon at Rain Makes Applesauce has a really imaginative use for a Build-a-Bear box, along with an accompanying youtube video to demonstrate how to use it! If you have a baby/toddler storytime, you must check this one out! Courtney at Miss Courtney Meets Bobo has a great ‘Who’s There?’ rhyme that goes along with a which house is the bird hiding behind game! Kids will be absolutely smitten with this one! Amanda from Toddler Tales has a flannelboard rhyme about raccoons! This one would work great with a woodland creatures theme! K at Storytime ABCs made some really spectacular seastar finger puppets to go along with her seastar counting rhyme. The silly faces on the sea stars are sure to delight! Tara from Storytime with Miss Tara and Friends has a lovely flannel to go along with the book, Birdsong by Ellie Sandall! Her flannel birds are exquisite! Jane at Piper Loves the Library has a great song about a giraffe named Sophie! Love the use of giraffe patterned felt, Jane! Last, but definitely not least, there are 3 eggs in a basket over at Storytiming! This one’s great for discussion-starting! This was probably my favorite round up yet! Lovely submissions. My favorite may very well be those elephants! I agree; we had some really great submissions this week. I’m so glad that I was able to host the roundup!